From breakfast smoothies to the very popular yogurt lemon cake, plain French yogurt can be a delightful addition to many dishes. 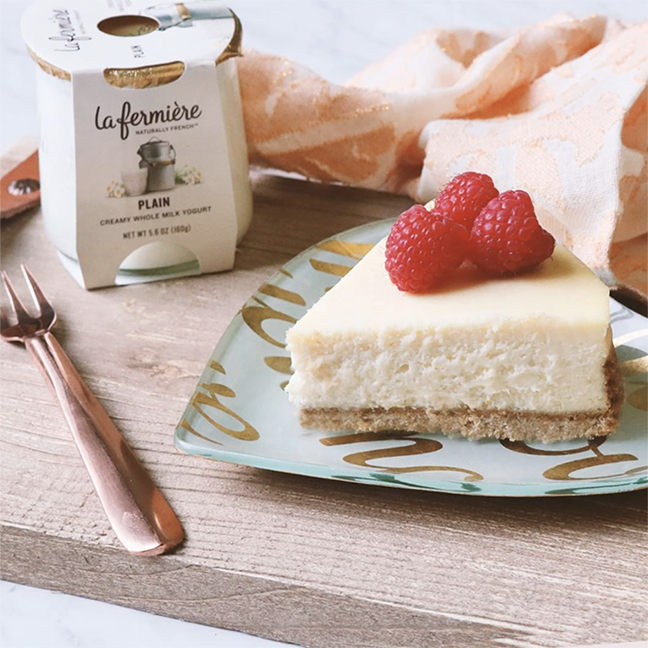 Using our La Fermière plain yogurt, this recipe makes for a delicious, perfectly rich and creamy, French yogurt cheesecake. During the summer days, we love to serve this mouthwatering cheesecake with fresh berries on top, perfect for a refreshing dessert. (1) Crust: Preheat the oven to 325°F. Prepare a springform pan by covering the bottom and sides with aluminum foil. Combine the graham cracker crumbs and butter in a bowl. Push into the bottom of the springform pan and just slightly up the sides. Bake for 10 minutes. Place the baked crust into a large baking dish. (2) Cheese cake: Bring the oven to 450°F. Bring a pot of water to a bowl. Set aside. Meanwhile, beat the cream cheese until loose. Mix in the sugar and the flour. Beat in the eggs, one egg at a time, beating well in between. Beat in the Plain La Fermière yogurt and vanilla extract. Pour into the crust. Pour the water in the large baking dish surrounding the springform pan and bake for 10 minutes. (3) Final baking: Reduce heat to 250°F and bake for another 1 hour and 30 minutes. Remove from the oven, take off the aluminum foil. Allow the cheesecake to cool for about 5-10 minutes and chill in the refrigerator until cool. (4) Serve when cool either plain or with toppings of your choice. Voilà!